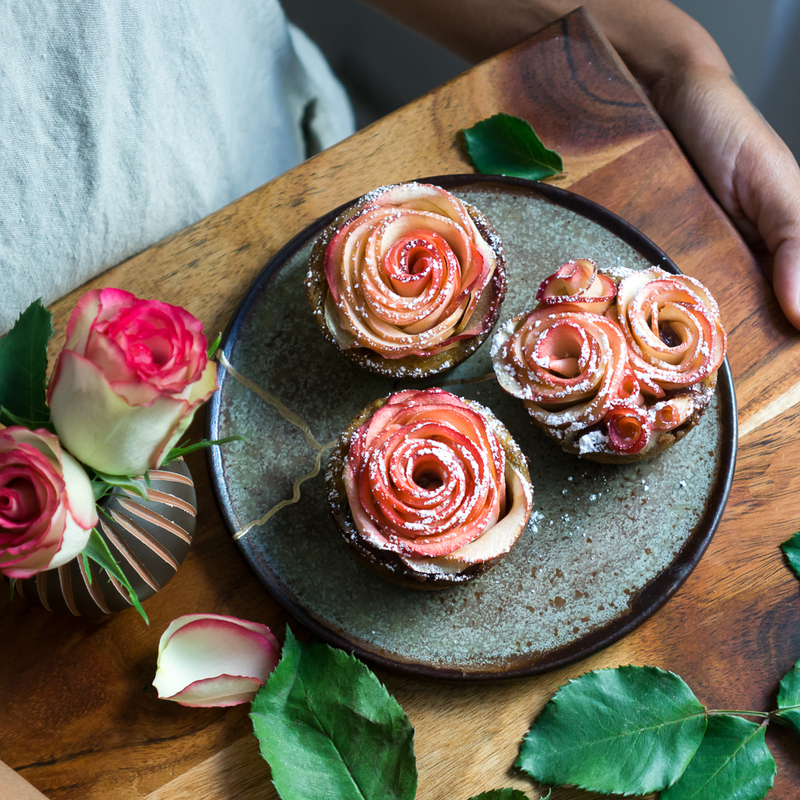 Earlier this year whilst finishing my second cookbook - Vegan Goodness: FEASTS - I wrote a promise between the pages to my future book readers that I would pop an instructional video for this recipe on my blog, to show them just how easy it is to make little roses out of apples. Fast forward to the middle of September and my new book hits shelves TOMORROW in the UK and EU (and on October 1st in AU and NZ), so I thought I’d better hurry the heck up and make said video already. I have to say, it’s a lot more lo-fi than what I had imagined, but lets be real now - I have no flipping idea how to make a fancy video *insert laughing face emoji* I do know how to make a GIF though, so that, dear reader is what you are getting. Please forgive me for the low production value as well as the very dry skin on my hands that were absolutely begging for some hand cream when Andy and I knocked this up while Louie napped on the couch earlier today. Place a saucepan of water that can fit a steamer basket (or, in my case, a colander) over it and bring to the boil. Cut the apples in half and then, using a mandoline on the number 2 setting, cut the apples into thin slices, placing in the colander/steamer basket as you go. Place the colander/ steamer basket over the boiling water, cover with a lid and steam the apple slices for 3 minutes. Remove from heat and set aside. Preheat the oven to 180°C (350°F/Gas 4) and grease a 12-cup muffin tray. Place the spelt flour, chickpea flour, salt, cardamom and bicarbonate of soda (baking soda) in a medium mixing bowl and stir to lightly combine. Add the apple sauce, orange juice, zest and vanilla and stir to combine. Set aside. Whatever you do, don’t lick the batter – raw chickpea flour is disgusting. Combine the almond butter and date syrup in a small mug or mixing bowl and set aside. To make the apple roses: Place about 10 pieces of apple in a long line, with a generous overlap (I like to place the edge of the second piece in the middle of the first piece and so on). Gently roll up, then curl about 10 more pieces of apple around it, overlapping, until you have a pretty rose. Repeat to make 12 roses and see video below if you are confused as feck. Spoon 1 scant tablespoon of cake batter into each muffin cup, making a little well in the centre of each as you go. Now, working one by one, spoon 1 teaspoon of the date and almond butter mixture into the wells and immediately top with an apple rose, pushing the rose down firmly when you place it in the batter. Don’t spoon all of the almond butter mixture into all the muffins first and then top with the roses, as the butter will run to the edges and you’ll miss out on the ooey gooey centre. Bake the cakes in the hot oven for 15 minutes. Allow to cool in the tray, then remove. You should be able to simply remove them with your fingers, unless some of the date syrup has escaped to the edges, in which case, use a butter knife to loosen the edges. Dust with icing (confectioner’s) sugar immediately prior to eating.